Getting around a city is stressful – and the more crowded the city, the worse it is. Cars, trucks, taxis, buses, bicyclists, and pedestrians all fight for space. Given the ever-increasing numbers of cars, and the lack of investment in public transit (not likely to change in the current fiscal climate), it’s going to get worse. Stop red light running: This is epidemic. I’ll see 2-3 cars go through an intersection after the light has changed. And I mean entering the intersection when the light is red. I find myself driving through red lights because I don’t want to get rear-ended! This can be solved with simple enforcement, particularly an expansion of red light cameras. Increase the fine (as far as I can tell, it’s only $100 right now in Mass. ), index it to inflation, and I suspect the fine revenue would cover the cost of the cameras. Reduce blind corners at intersections: There are far too many corners where you can’t see oncoming traffic unless you pull practically into the next road. Sometimes this is unavoidable, but there are also many situations where foliage obscures views, or where landowners have erected huge fences. In addition, parking is often allowed too close to corners, creating additional blockages. The latter is easily solved. The issues with private property are tough, especially in this country with its obsessiveness about property rights, but it doesn’t strike me as too onerous to limit landowners to shrubbery or fencing that is low enough for drivers to see over or through, while also providing some privacy for the landowner. Eliminate pedestrian-only walk lights and use pedestrian advance signals: The pedestrian-only walk light is a waste. Pedestrians get frustrated waiting for their cycle to come up and jaywalk. Drivers get frustrated when the all-walk signal comes in and no pedestrians are using it, because they’ve all given up and jaywalked already. Eliminate them and replace them with the pedestrian advance signal used in Cambridge: the walk signal comes on a couple of seconds before the green light. 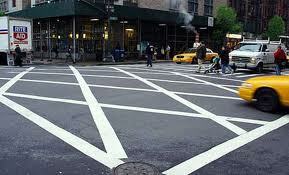 This gives pedestrians the opportunity to step out and prevent conflict with cars turning. Improved crosswalks and more enforcement: As a pedestrian, I’m often frustrated or angry that drivers don’t stop at crosswalks. As a driver, however, it can be very difficult even to see a crosswalk and then to know someone is intending to cross, particularly at night. My suggestion: reduce the number of crosswalks between intersections, but do a much better job with these crosswalks: better road markings, signage, overhead lights, and, above all, increased enforcement. Stop jaywalking: This goes with the above: you can’t increase enforcement of crosswalks without also increasing enforcement of jaywalking. It’s tough: who hasn’t walked against a “no walk” sign when there is no traffic. Stop “blocking the box”: It’s one of the most frustrating and messy situations in city streets: drivers pull into an intersection before it has cleared. Then the light changes and they’re stuck in the middle of the intersection blocking traffic. A number of cities have started using signage and road markings (see images) to address this. Staying to the right on highways: While this is mostly about streets, it’s hard to avoid this one. People tend to stick to the middle lanes, leaving the right (i.e. slower) lane virtually empty and the left (i.e. higher speed) lane crowded. People get frustrated and pass on the right. In Great Britain, I saw several large signs on the motorways telling people to pull over and allow others to overtake. I’ve seen similar messages on electronic signs here in Mass., but absent education and enforcement, they’re worthless. More education: Many if not most of these issues wouldn’t be issues if people were educated about the rules of the road. A 2008 survey by GMAC found that 16.4% of drivers (about 33 million people) wouldn’t pass a written road test. 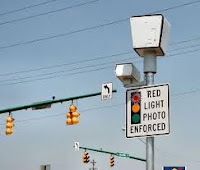 Those who would pass still weren’t that knowledgeable: 84% could not identify the correct action to take when approaching a steady yellow traffic light, and 73% could not properly identify a typical safe following distance from the car in front of them.